Do you draw the hard way? Odds are you do draw the hard way. I assert that based on over 45 years experience in art. Let me explain. Especially when you're less inexperienced at something, it's very easy to unknowingly make things harder and more complex than they need to be. It's the old "you don't know what you don't know" syndrome. Now, I suspect you have seen or heard the acronym KISS (Keep It Simple Stupid). I've often heard this used as advice to candidates running for public office. Stick to the big picture stuff. The details may bore people who don't understand what you're saying and upset the ones who do. While that may be a cynical view of politics, KISS, the advice to "keep it simple", aptly applies to art. It is so easy to begin a drawing (or painting) and immediately start including all the little details. This is how you draw the hard way. Because drawing becomes much easier when you start simply. First establish where your subject will be on your paper or canvas, then get its size (its proportions) correct, then begin to draw it using very simple shapes first – KISS. Contractors don't build houses by framing a few walls and then start adding bath tubs, sinks and carpet. No, they first put in a firm foundation. Then frame all the outside walls. Then put in the floors and the roof. Sticking to this basic but crucial procedure allows them to avoid major problems later and easily correct any mistakes. Sticking to a simple process has the very same advantages when you do art. Assume for a moment that you wanted to draw this scene. What would you do next? Remember KISS. 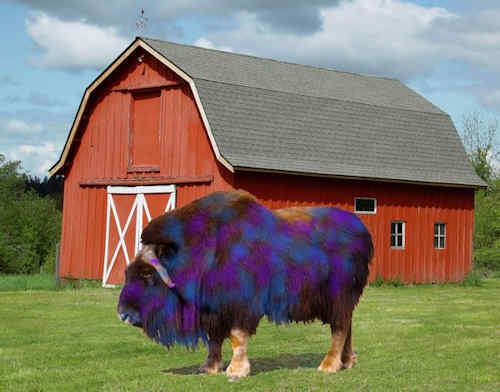 You could start with either the barn or this flamboyant musk ox. 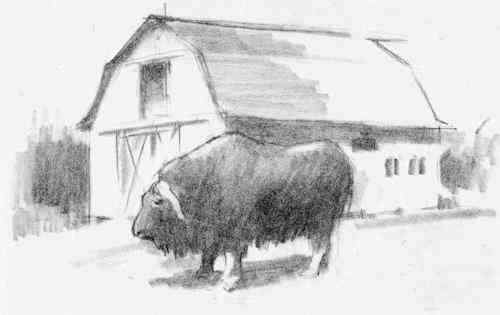 If you chose to draw the musk ox first, you would begin by finding its overall proportions. (fig. 1). The line in the middle is where its left leg and shoulder line up. The short line on the left is where the end of its nose will be. The line on the right is approximately where its rump will be. After measuring the proportions of the musk ox on the photograph, you might be surprised to discover that the front left leg almost divides its body in half horizontally. This is one of those situations where your eyes might not see things accurately. To my eyes its body from shoulder to rump looks longer than it really is. Measuring its proportions before starting to draw reveals the truth and saves you from problems later on. With the overall proportions established, you begin to draw the musk ox using very simple shapes (fig. 2). You get its overall shapes correct and then refine those lines. The important thing to remember is to KISS – keep things simple. That will help you avoid drawing the hard way. 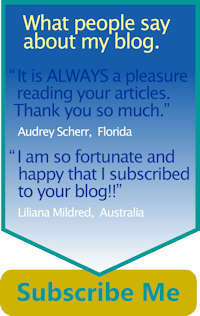 For more information about drawing the right way, read on. P.S. When you start a drawing or a painting do you trust your eyes to see your subject's proportions correctly? Or do you actually check them? Just like a building contractor, you can eliminate a lot of problems in your work by learning the crucial, basic process of measuring proportions like an artist. Don't draw the hard way. Build your foundation first. Make sure your proportions are correct. Start your drawing simply and gradually build your subject. It's like the old woodworker's adage: Measure twice; cut once. Spend the time in the beginning to get it right. To help you do that click here to learn more about how to measure proportions like an artist.